The pair USD/CAD continues to trade in the downward channel. Last Friday CAD received support from favourable data on Canadian labour market. Unemployment rate fell to 6.9% in March against the forecast of 7%; number of new jobs doubled versus expectations. Positive statistics helped the pair overcome the level, of 1.1000 and consolidate below this level. This week attention shall be focused on the Canadian construction sector news, forecast for which is positive. On Tuesday Canadian data on number new constructions and approvals for construct will become known. If the data is weak, the pair may go back above the level of 1.1000. Technical indicators show further decline in the pair. MACD is in the negative zone, the signal line is directed downwards, volumes are increasing. All three moving average lines are directed downwards. Stochastic is below the middle line, indicating sideways movement. Support levels: 1.097 and, 1.0920, the latter one is the main target of the bears. Resistance levels: 1.1000, 1.1030, 1080, 1.1120. 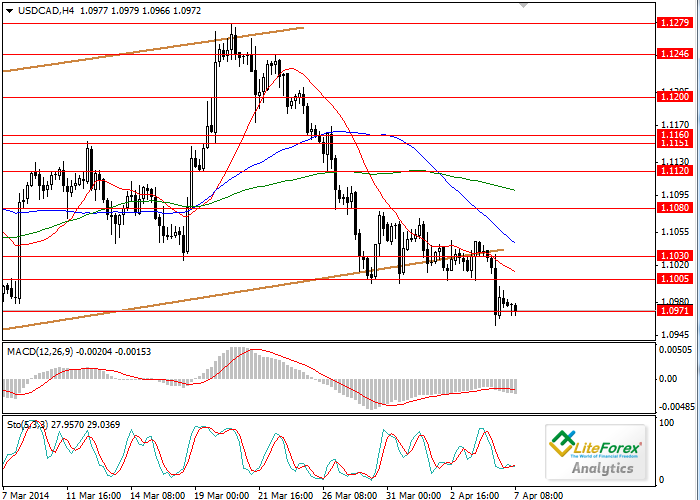 Sell the pair below the level of 1.0970 with the target of 1.0900. Long positions are recommended after consolidation of the price above the level of 1.1030.